Gamers across the globe are getting very excited about a game called Watch Dogs, which is released today on Xbox One & 360, PS4 & 3, and PC. But if you’re one of the bewildered masses (i.e. a non-gamer or parent of an avid gamer), then you might be wondering what all the fuss is about. Well, we’re here to help. Here’s everything you wanted to know about the biggest game of the year, but were too afraid to ask. Oh, Watch Dogs! I’ve heard of that! It’s got Anne Robinson and that nice bloke off the news in it! Nope, sorry, completely wrong track. It’s an open-world action adventure (think Grand Theft Auto) set in a future version of Chicago where everything (including traffic lights, street lights and more or less everything else a city relies on) is controlled by one single supercomputer. You play as a hacker called Aiden Pearce who just happens to be able to access all of this information for his own purposes. The game sees you hacking into stuff (infrastructure, bank accounts, other people’s smartphones, etc.) in order to complete missions. It’s kind of like Deus Ex. Glad you asked. Although Watch Dogs sounds like a simple combination of other successful games, it promises to be a lot bigger and a lot more innovative, offering players an unprecedented amount of freedom. You’ll have the ability to fight and shoot people, because it’s practically a crime not to include one of these two elements in a big-budget title. Combat will be a mix of stealth and parkour, which you might know as the sport in which grown men jump off big stuff. 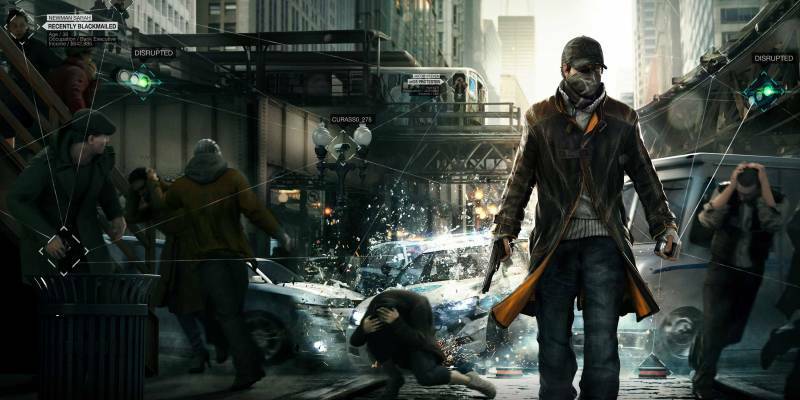 Remarkably, Watch Dogs has also won over 173 awards even though it’s not actually out yet. If that isn’t the sign of a great game, we don’t know what is. Will it be a struggle to buy on the first day? Maybe. It probably won’t sell as much as a Call of Duty or Grand Theft Auto title, but midnight launches are planned throughout the country. Ubisoft, the producers of the game, have predicted that game will sell over 6 million units worldwide, making it one of the most successful original (i.e. not part of an existing franchise) videogames ever. It’s already the most pre-ordered game of the year, so things are looking promising. The game is officially titled Watch_Dogs, although it’s no longer the 90s so no-one is typing it out like that. Don’t be the first. How much and where can I get it from? Depends, really. The RRP for the PS4 and XBOX One versions is £59.99, while you’ll be able to pick up the PS3 and 360 versions for £39.99. Remember, you can always sell some games with musicMagpie to make a bit of cash to put towards it! Watch Dogs is out today.